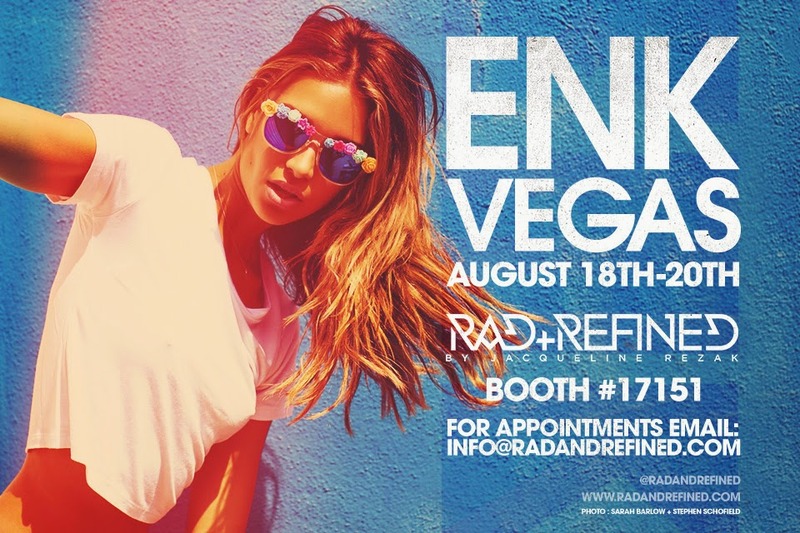 Rad + Refined is excited to announce that we will be showing our collection of Rad Basics and Rad Bands at ENK shows in Las Vegas along with our favorite flower child Michelle Madonna of That Madonna Girl! Celebrity Fashion Stylist, Jacqueline Rezak and founder of online clothing boutique and lifestyle brand Rad + Refined will be on site August 18th-20th at Mandalay Bay Convention Center in Booth #17151 with her "effortlessly rad" and affordable collection of basic's including tanks, tee's, and more with each item below the retail price of $100. Rezak's collection of basics have been spotted on celebrities such as Miley Cyrus and picked as a closet must have by E! News. We are currently stocked at boutiques such as Fred Segal + Planet Blue. In addition to Rezak's collection of Basics, she has also been amping up the accessory scene with her unique collection of sunglasses that go by the name of "Rad Bands". These 'show stoppers' are broken down into three styles: Retro-Glam, Statement Sunnies, and Rad Classics all of which retail for $20-$50. These have been featured by the NY Post as a must have addition to your summer wardrobe and a favorite by celebrities. We look forward to sharing the Rad + Refined collections with you at ENK Vegas!